Today while running some errands in Santa Monica I was lucky enough to catch a food truck mini-meetup - 3 of em in one place. It really isn't all that uncommon to find many trucks at once, but its a first for me. 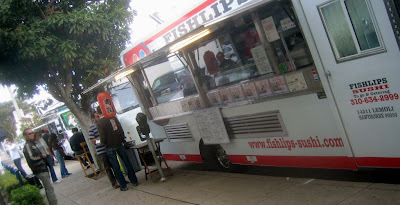 Several of them often merge in the same area during lunchtimes in certain areas or for street festivals, and several parking lots are in the process of securing permits to be able to have food truck food courts in their lots (after an attempt at that was shut down recently in Santa Monica). It was my first chance to try India Jones (Indian food) and Barbie's Q (barbecue). 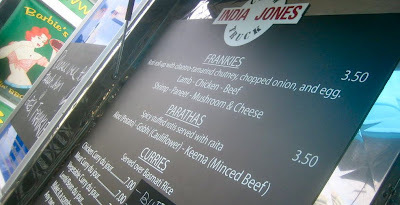 Both were good, but since I had a smaller taste of India Jones, I'm anxious to try more, because the lamb "frankie" I had was really good. I did learn today that Hermosa and Manhattan Beach don't allow food trucks, though hopefully as their popularity continues to grow, perhaps that will change. Until then, I'll keep chasin em down when they come nearby to El Segundo, Hawthorne, or Marina Del Rey.